This year saw the issuing of the largest motor vehicle recall in Australian history. Following a damning safety assessment by the Australian Competition and Consumer Commission, tens of thousands of vehicles have been recalled nationally. Globally, the number of recalled cars is 4 million. The reason lies in airbags from a company called Takata. You might have heard about these airbags over the last couple of years. Some have proved to be faulty and have lead to numerous deaths and injuries across the globe, including two deaths in Australia. Prior to this year, several car manufacturers had issued voluntary recalls to deal with the issue. This year, the Australian government officially announced a compulsory recall across all affected makes and models. So what’s the actual problem? How do you find out whether your car’s affected? What do you do if you are? And how do you avoid the problem altogether? Takata is a company which, amongst other things, manufactures airbags. Several of their airbags have been found to be faulty. These faults have caused 23 reported deaths and some 230 injuries globally. Airbags use a propellant to launch the bag during an impact. In the case of the Takata bags, they used a chemical called phase-stabilised ammonium nitrate. For safety reason, a drying agent is supposed to be applied to prevent exposure to moisture and degradation of the chemical. This drying agent wasn’t applied to some of Takata’s airbags. The result is that the airbag may deploy with excessive force, which can lead to shrapnel being propelled into the car occupants. Serious injury and death can and have occurred. Compounding the problem is that you don’t even need to be in a collision to deploy the bags — sudden breaking can also lead to the airbags being set off. 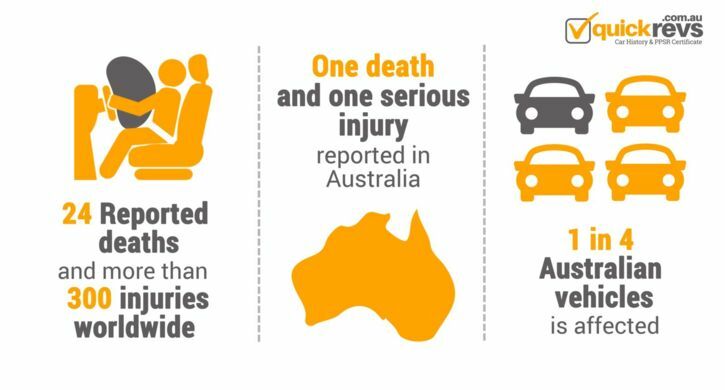 Takata airbags are thought to affect two out of every seven cars in Australia. Between 2017 and 2018, 930,000 Australian-registered vehicles had been recalled. In August of this year (2018), it was revealed there were still 1.9 million airbags needing to be recalled. Other types of Takata airbags are considered lower risk, but still need to be replaced. How to check if your car is affected? There are many ways to check to see the status of your vehicle. “Is My Airbag Safe” is a simple website where you can enter your license plate and state to check your vehicle. There is also a section for “future recall”. An affected Takata airbag can actually take 6-25 years, or 6-9 years in humid climates, before they actually become dangerous. A brand new vehicle with a new Takata airbag is still considered safe to drive for the first few years. Vehicles such as these are on the “future recall” list. Due the compulsory recall, the Australian government has updated the REVs/PPSR to include information regarding the airbags. A REVs Check Report gives you a comprehensive car history report, covering things like stolen status, financial encumbrance, and whether it’s ever been written off. Now, it also tells you if the vehicle is affected by the Takata airbag recall australia. This vehicle is identified as being affected by the compulsory Takata airbag recall list australia. Faulty airbags can kill or seriously injure you and your passengers. For more information about the compulsory Takata recall see www.productsafety.gov.au/recalls. If you check a vehicle and it returns the above, we recommend informing the seller so they can address the issue first. Since the recall is free of charge, there should be no reason for the seller to not want to replace the airbag before selling the vehicle. To get a REVs Check report, enter a car’s VIN or rego number on any page of this website, click the submit button, pay the nominal fee, and get your comprehensive report in minutes. Don’t risk buying a dodgy used vehicle — and don’t risk buying a death trap. Get peace of mind today. What to do if your car is affected? They will help you arrange a time and place to have the vehicle’s airbags replaced. Do I have to pay for the replacement? No. This compulsory recall means that the airbags must be replaced for free. If you think you’ve been charged for your replacement, contact the ACCC to lodge a complaint. It’s important to note that this does include used vehicles. Any vehicle affected by the compulsory recall must have its airbags replaced, for free.